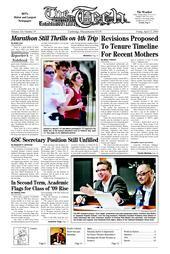 CORRECTION TO THIS ARTICLE: The April 21 article “Revision Proposed To Tenure Timeline For Recent Mothers” reported that the proposed changes included making a one-year tenure clock extension for women automatic. In fact, this automatic one-year extension policy has been in place at MIT since 2001, making MIT first to implement it, not Princeton University, as reported in the article. As universities nationwide address a gap between the number of tenured male and female faculty members, MIT is considering expanding its policies for extending the tenure clock for female faculty giving birth. A proposed policy, which MIT’s Academic Council will vote on next month, would automatically extend the tenure clock by one year for female faculty giving birth. MIT’s current policy, created in 2001 as a five-year experiment, allowed a one-year extension of the tenure clock, but not by default. Additionally, if a second child is born during the tenure clock, the new policies guarantee that a request for another one-year extension will be granted by the provost. The policy was presented at Wednesday’s faculty meeting, along with an update from the Committee on Discipline and Energy Research Council. Under the current policy, women faculty may be reluctant to ask for an extension for fear of hurting their chances of being granted tenure. In a speech last October, Shirley Tilghman, president of Princeton University, explained why Princeton, which allows both male and female faculty who are new parents (adoption included) a one-year tenure-clock extension, decided to make the extension automatic for women last August. “We discovered that men tended to take advantage of the tenure extension more often than women, who were afraid that requesting the extra year would be interpreted as a sign of weakness or lack of confidence,” Tilghman said. Only Princeton University does not have a cap on the number of years given for extension, Bailyn said. Princeton has a six-year tenure clock, compared to MIT’s eight-year clock. Associate Professor Margery Resnick, who has chaired the Committee on Discipline for the last two years, gave a report on the committee’s actions during the 2004–2005 school year. That academic year, 23 cases, six non-academic and 17 academic, were reviewed before the committee. The cases were for a freshman, five sophomores, eight juniors, six seniors, and three graduate students. During the 2004–2005 school year the committee also put in place an initiative that ensures a student’s advisor, housemaster, Student Support Services, and the registrar’s office are immediately notified once sanctions are imposed, so that students who receive disciplinary action cannot load up on unblemished transcripts before the sanction is indicated on them, Resnick said. After Resnick completes her term on the discipline committee this year, Professor Suzanne H. Corkin will be the only female faculty member (of six total) on the committee, Resnick said, though it will still have female deans and undergraduate students. Gender balance is important, as cases of sexual misconduct often come before the committee, she said. At the Wednesday meeting, President Susan Hockfield encouraged the faculty to attend the Energy Forum on May 3, which she said will mark the end of Phase I and the beginning of Phase II of the energy initiative. Professor Ernest J. Moniz and Professor Robert C. Armstrong, co-chairs of the Energy Research Council, will present the council’s report, which will address strategies to improve old technologies and ways to implement new technologies, Hockfield said. The report, which will show that new technology needs to be interwoven into smart, insightful policies, is “enormously broad-reaching, deep … and practical,” she said.